For those coming to on this wonderful tour, we hope you are looking forward to the tropical weather. Daytime it will be 26-30 degrees, and at night; a pleasant 24, where light shirts are all that’s needed. As with all Angel trips, we take you to each region when the weather is perfect. Much of your travel will be by boat on this holiday: you’ll travel towards China in a convoy of six seater boats, fitted with Peugeot 505 car seats for example, to make you more comfortable (that night you’ll sleep in stilted jungle lodges along the river). On another river trip, we’ll take you by a large traditional boat and you’ll travel over the largest lake in Asia; eventually sailing through narrow riverways into the heart of Cambodia – a challenging and exciting journey: we never know what quite to expect. And throughout the trip – warm sunshine. It leaves one to ponder, what to do with you coat you wear to your UK airport? We hope you are getting excited…. 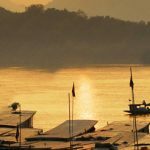 Nepal: and for those leaving the UK for quite another world up here in the Himalaya, you might like to listen to this radio programme featuring our trip by a former traveller. It gives you a taste of what to expect. Bring a light pullover/fleece top for the late evenings as it can drop below 16 degrees sometimes. We wish you a pleasant flight and hope you enjoy the show. This year will be the last public tour of Laos and Cambodia run by Angel Holidays; it’s an exceptional experience and takes a lot to organise. One of the highlights is Luang Prabang on the Mekong. There’s a bamboo bridge here, that gets washed away each year by the monsoon; only to be hand built again by locals. This simple walking bridge links the town to a wonderful jungle hamlet on the other side of the river. Our guests often use this at night, to reach an intimate and shrouded open air restaurant, under the trees, candle lit, and elevated on platforms by the river’s edge. Here you can eat wonderful food amongst sounds from the jungle. Here’s a photograph taken of the river at sunset. For those coming with us to Vietnam, the food will make an interesting addition on our tour. We’ve made the trip B&B on several nights, allowing you to go out and explore, rather than being stuck with hotel food (not that it’s bad either). Vietnam is much more than noodles, rice and chicken, hot pots or clay pots: and it’s not just the food either but knowing how to eat it. You may be given a set of several dishes and sauces, together with leaves to wrap it in, certain sauces to add to a broth, or other sauces that should be kept separate for dipping only. You’ll need to ask our guide. To get you started here’s an overview of some of the dishes. Nepal: you’ll see Deshain, but what is it? Nepal: and for those joining our tour this year, you’ll also witness Deshain, the most important event in the Nepalese calender. Put simply, this is a festival that marks the coming together of families, the beginning of the new year, all combined in a Nepalese Christmas. Nepal has been locked away from the outside world until 1959, which means many of its practices are unusual – the sacrificing of animals for example – particularly buffalos – is part of Deshain. Brothers bless sisters (and if they don’t have one they hire one from a neighbour), children sing, and elders play music. This is joyous coming-together. It’s a colourful time of celebration too. Make-shift bamboo swings are put up for children in the mountains along the Himalaya, candles are lit across cities, and in a modern exuberance – there’s even fireworks too. Elephants are blessed with tikas (red vermilion powder on their foreheads) as well as dogs, ducks and even birds. People of course, too. We hope our visitors will enjoy this event. VIETNAM: and for those coming with us next April, you might like to watch this short video in which the late Anthony Bourdain, visits the ‘Lunch Lady’ a very simple food stall in central Saigon. Lunch here – a grouping of 4 to 7 plastic plates – costs just £3. It’s rudimentary, local and simple. So simple in fact, there’s no choice. You simply show up, sit down and the food of the day is brought to your plastic table. Sitting on your plastic chair; no more elevated from the ground than a child first attending nursery school, amongst the back streets of the city, over hung with trees and some litter, you may ponder your choice. Don’t expect anything fancy, but just honest, tasty food. [This text has been taken from the Angel Holidays guide that accompanies this tour]. For those coming with us to India this November, you might like to see this old video with the charismatic Keith Floyd. This will give a real flavour of what to expect with the sumptuous Rajasthani food. And for those coming with us this year, here is a preview of what is to come. The photographs from this slide show have all been taken by Angel Travellers. 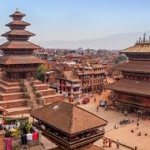 We’ll begin in Kathmandu, staying near the lively backpacker district, before moving on to Bhaktapur; a town so beautiful and locked in time; we need to arrange a permit for you to stay there. We then move south towards India, and stay near Chitwan jungle reserve, before moving to Lumbini, spending a night in a monastery at the birthplace of the Buddha. Next we drive through the mountains to Pokhara below the Himalaya, before returning to Kathmandu valley and then home. It’s a unique journey, shaped by people and landscapes. We hope you are looking forward to it. And these images, present just a fractional foretaste of what is to come. For those coming on our holiday to Vietnam with us this year, you might like to see this video of the late Anthony Bourdain, as he enjoys (in quite long anticipation) pho – noodles. You will have ample opportunities to sit with the locals on small plastic chairs and enjoy the national dish – and the local atmosphere….. This year our group coming to Nepal will stay in the Mandala Boutique Hotel; perfectly placed on the cusp of an area called Thamel – with over 100 restaurants of every persuasion to choose from. On the roof terrace of the hotel, perhaps to enjoy a drink, you’ll be able to see the temple of Swayambunath, a Unesco symbol of Nepal, where Buddhist legend tells us Kathmandu was born. The hotel allows our visitors to walk literally everywhere downtown. Despite being in a quiet enclave, it is just minutes from all that Kathmandu has to offer. Markets and bazaars are on your doorstep, and you can choose to eat anything around here; from traditional food to Indian, Chinese/ Tibetan to a burger or chicken & chips – we can show you where. After the exhilaration of Kathmandu, we’ll move to a medieval town of complete contrast. Staying in a simple guest house, the city of Bhaktapur closes down by 9pm, and is largely under candle light. We will get our group a special visa to go there, as the whole town it is protected as a place of unique world heritage. It’s like stepping back in time. We’ve 3 places remaining for our Nepal trip, please contact is via this site if you might like to come.